CLICK HERE to listen to episode audio (3:47). All Web addresses mentioned were functional as of 6-30-17. From the Cumberland Gap to the Atlantic Ocean, this is Virginia Water Radio for the week of July 3, 2017. This week we feature a Fourth of July mystery sound. Have a listen for about 20 seconds, and see if you can guess what’s making the chirping, squawking, and wailing sounds. And here’s a hint: If Benjamin Franklin had gotten his way, U.S. money might contain a picture of a Wild Turkey instead of a likeness of this creature. If you guessed a Bald Eagle, you’re right! Despite disapproval by Ben Franklin—who wrote that Bald Eagles’ habit of stealing food from other birds set a bad example of dishonesty—the Bald Eagle became the national emblem in 1782 when its image was included in the Great Seal of the United States. Real Bald Eagles do, in fact, get food by taking fish that other birds have captured, along with scavenging and some hunting for a variety of animals. Bald Eagles have recovered dramatically from endangered species status in the United States, and they’re found in every state except Hawaii, typically along large water bodies with long shorelines, such as the Chesapeake Bay and Virginia’s major rivers. In these areas the birds nest in tall trees, using interwoven sticks, grass, and other materials to build large structures that may be re-used for many years. The eggs incubated in those nests result after courtship flights described as spectacular and acrobatic, and it’s believed that most eagle pairs mate for life. Inspiring appearance; aerial skill; durable constructions and bonds; resilience—apparently the good Dr. Franklin missed these national-emblem-worthy characteristics of Bald Eagles. Thanks to Lang Elliott for permission to use this week’s sounds, from the Stokes Field Guide to Bird Songs. And we close with a few seconds of music for our national bird, “Bald Eagle of Virginia,” by Timothy Seaman of Williamsburg. Happy July 4th! The sounds of the Bald Eagle were taken from the Stokes Field Guide to Bird Songs-Eastern Region CD set, by Lang Elliott with Donald and Lillian Stokes (Time Warner Audio Books, copyright 1997), used with permission of Lang Elliott, whose work is available online at the “Music of Nature” Web site, http://www.musicofnature.org/. “Bald Eagle of Virginia,” a brand new work composed on June 29, 2017, is copyright by Timothy Seaman and Pine Wind Music; used with permission. More information about Timothy Seaman is available online at http://timothyseaman.com/. Click here to hear the full version of the composition (1 min./52 sec.). This episode updates and replaces two previous episodes featuring the Bald Eagle, Episode 57 (3-14-11) and Episode 117 (7-2-12). Bald Eagle sounds are also included in Episode 294 (12-14-15), on the annual Christmas Bird Count organized by the National Audubon Society. White-headed Eagle (a formerly used name for Bald Eagle) painting originally published between 1827 and 1838 by John James Audubon in Birds of America, Plate XXXI (31), as reprinted in 1985 by Abbeville Press, New York. The painting includes wwhat Audubon called a Yellow Catfish caught by the bird. Photo taken June 29, 2017, from the reprint copy (no. 6 of 350 copies printed in 1985) owned by Special Collections of Virginia Tech Libraries. Virginia Water Radio thanks Special Collections for permission to photograph their copy and for their assistance. Information about Birds of America is available from the National Audubon Society, online at http://www.audubon.org/birds-of-america. Bald Eagle in flight. Photo by Todd Harless, made available for public use by the U.S. Fish and Wildlife Service's National Digital Library, online at http://digitalmedia.fws.gov, accessed 6-29-17. Following are excerpts from the Virginia Department of Game and Inland Fisheries, “Fish and Wildlife Information Service/Bald Eagle/Life History,” online at http://vafwis.org/fwis/booklet.html?Menu=_.Life+History&bova=040093&version=17347. “In adult plumage, the head, neck, tail, and upper and lower tail coverts are white. …The juvenile and subadult plumages are mainly brown, including the head and tail. …The adult plumage is attained in about 4-5 years. “This species nests almost exclusively in live trees, although desert populations will sometimes nest on cliffs or on the ground. The average height of a nest tree in the Chesapeake Bay region was 27 meters. Nest trees usually have stout limbs and open canopies which provide a clear flight path into at least one side of the nest. The nest is usually just below the crown of the tree. The nest is constructed with large sticks with softer materials such as dead weeds, cornstalks, grassses and sod as a lining. …They tend to nest close to shore, but will nest further inland if shorelines are disturbed by humans. “The bald eagle feeds mainly on fish but also takes birds, mammals, and other invertebrates. …This species uses communal roost sites and congregates at foraging areas in the winter and summer. …This species requires a constant food supply best met through a diverse prey base …This species will concentrate in the area of large fish kills such as the vicinity of large power plants. This species is opportunistic and will utilize both live prey and carrion. Besides fish, they also take waterfowl, muskrats, cottontail rabbits, and 5 species of turtles. “Tree species used for nest sites include loblolly (most frequent), and Virginia pines, oaks, tulip poplar, beech, and hickory. “Storms and other adverse weather conditions are considered by many to be a threat to nesting bald eagle populations. The accidents that usually cause mortality are collisions with power lines and other obstructions, and less frequently with aircraft. The presence of DDE in eggs can cause eggshell thinning and is associated with the reduction in mean productivity for this species. Reproductive success is also influenced by dieldrin and PCB levels. There is also a potential for lead poisoning where eagles feed on prey that has been killed or crippled by lead pellets. Habitat modification and the destruction of nests continue to be limiting factors for eagles in the Chesapeake Bay Region. “Eagles will attack osprey that are carrying fish and drive them away if they are foraging in the eagles area. They also interrelate with the American crow, common merganser, great black gulls, common ravens and northern harriers. …The eagle must sometimes compete for the same nest with the great horned owl. They must also compete with the osprey and herons during periods of food shortage. John James Audubon, “White-headed Eagle,” from Birds of America (1827-1838), Plate 31, accessed at the Audubon Web site, online at http://www.audubon.org/birds-of-america/white-headed-eagle. 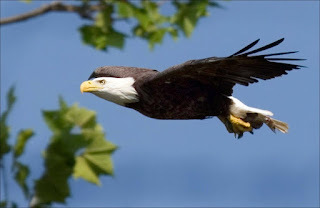 Center for Conservation Biology, “Bald Eagle,” online at http://www.ccbbirds.org/what-we-do/research/species-of-concern/virginia-eagles/; and “Facts About Eagles,” online at http://www.ccbbirds.org/what-we-do/research/species-of-concern/virginia-eagles/facts-about-eagles/. The Center for Conservation Biology is a joint research program between the College of William and Mary and Virginia Commonwealth University. Chesapeake Bay Program, “Bald Eagle,” online at http://www.chesapeakebay.net/fieldguide/critter/bald_eagle. Stanley Finger, Doctor Franklin’s Medicine, University of Pennsylvania Press, Philadelphia, 2006; description available online at http://www.upenn.edu/pennpress/book/14178.html. Library of Congress, “Symbols of the United States,” online (as PDF) at http://www.loc.gov/teachers/classroommaterials/primarysourcesets/symbols-us/pdf/teacher_guide.pdf. 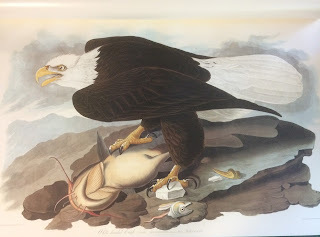 Hope Rutledge, “American Bald Eagle Information,” online at http://www.baldeagleinfo.com/. U.S. Fish and Wildlife Service, “Bald and Golden Eagle Information,” online at https://www.fws.gov/birds/management/managed-species/bald-and-golden-eagle-information.php. Virginia Department of Game and Inland Fisheries, “Fish and Wildlife Information Service,” online at http://vafwis.org/fwis/?Title=VaFWIS+Species+Information+By+Name&vUT=Visitor. American Eagle Foundation, “Washington, D.C., Bald Eagle Nest Cam,” online at http://www.dceaglecam.org/. U.S. Fish and Wildlife Service/National Conservation Training Center, “Eagle Cam,” online at https://nctc.fws.gov/topic/eagle-cam/. Alice Jane Lippson and Robert L. Lippson, Life in the Chesapeake Bay, Johns Hopkins University Press, Baltimore, Md. (2006). Episode 323, 7/4/16 – Imagining a Green Frog debate for July 4th. K.7 - basic needs and processes of plants and animals. LS.10 - changes over time in ecosystems, communities, and populations, and factors affecting those changes, including climate changes and catastrophic disturbances. USI.5 – factors that shaped colonial America and conditions in the colonies, including how people interacted with the environment to produce goods and service. USI.6 – causes, people, and results of the American Revolution.